If you own a WordPress site and like to write then WP Word Count is for you. WP Word Count offers a wide variety of information and analysis of the content you’ve created for your website. 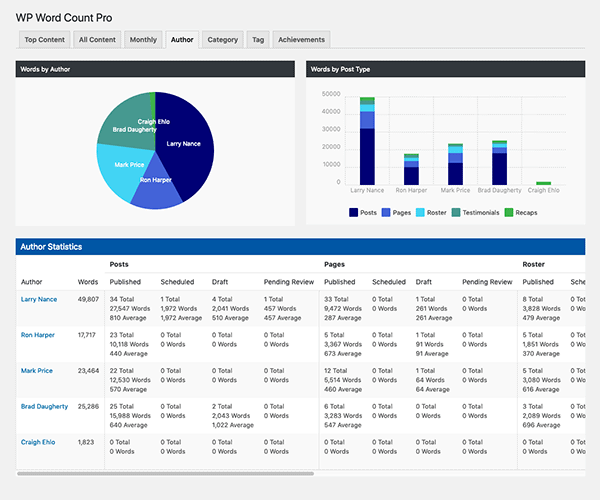 Decide exactly what post types and statuses to see in your statistics using a Pro only Settings option. 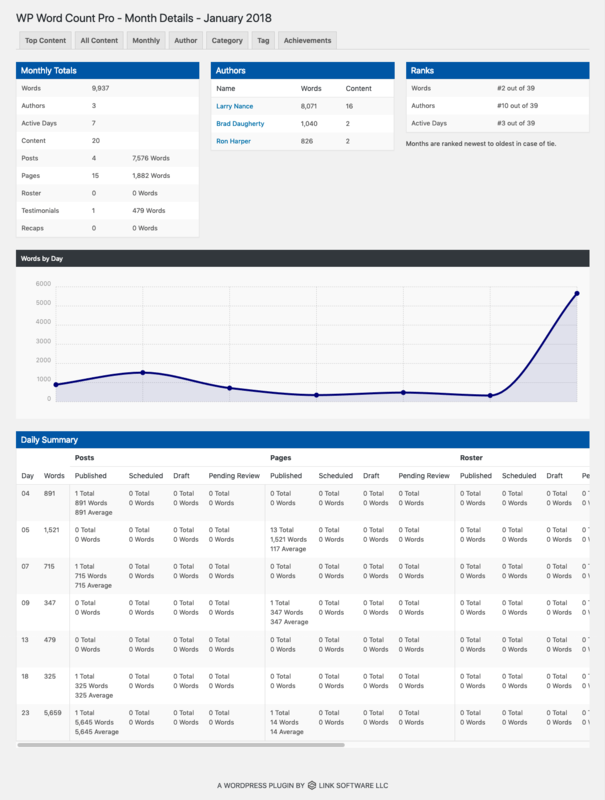 Charts and graphs on nearly every screen of the plugin to help you better visualize your content and writing production. Expanded post details with revision history, post ranking and more. 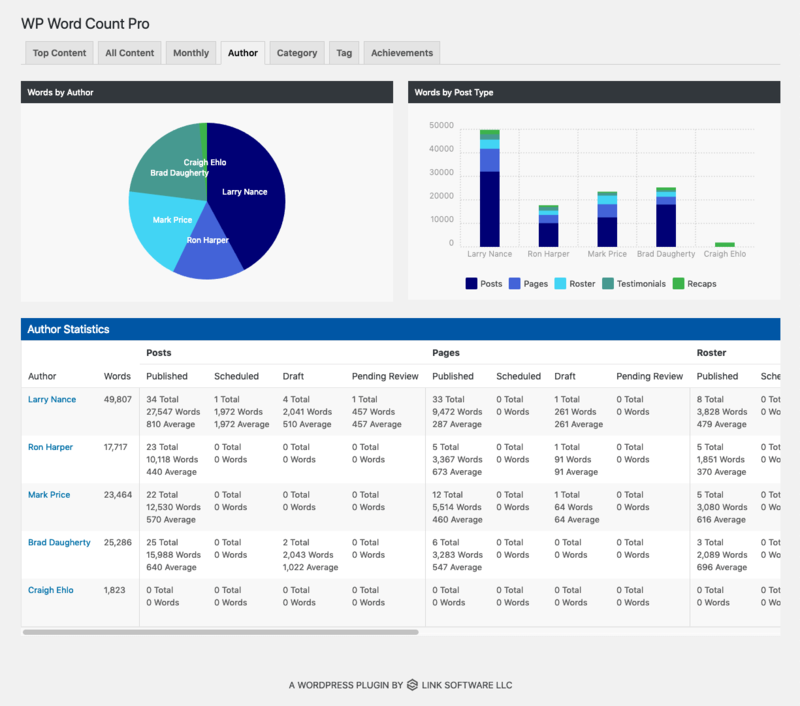 Quick “At a Glance” word count statistics on your WordPress Dashboard. 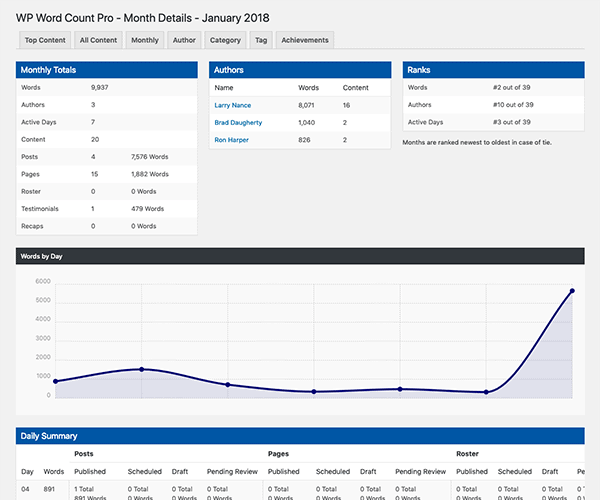 WP Word Count Pro comes with deeper monthly analysis of your content to give you a better idea of how your site has increased or changed over time. Get an overview of how many words and posts were added to your site in a given month and how many days your authors were active. 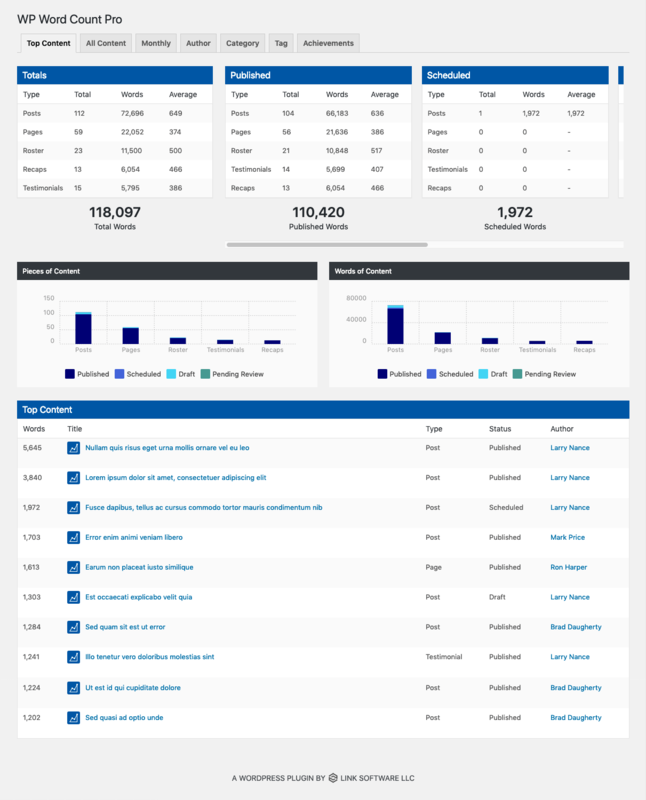 View a daily summary showing which days of the month content was added by type and word count. Learn how months compare to each other to find out when your writing output was at its highest. 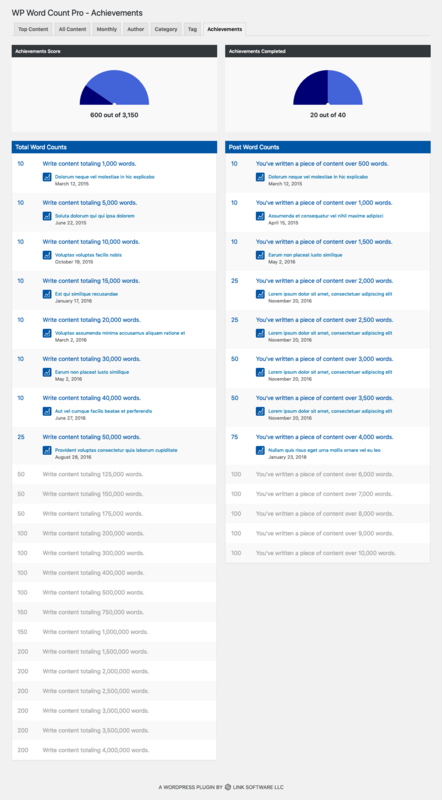 See how many authors wrote on your site in a given month and how many words they wrote. With our advanced Author view, WP Word Count Pro owners with a writing staff can get an overview of each of their team’s productivity. Find out how many posts your writers have created of each type on your site (even custom posts). 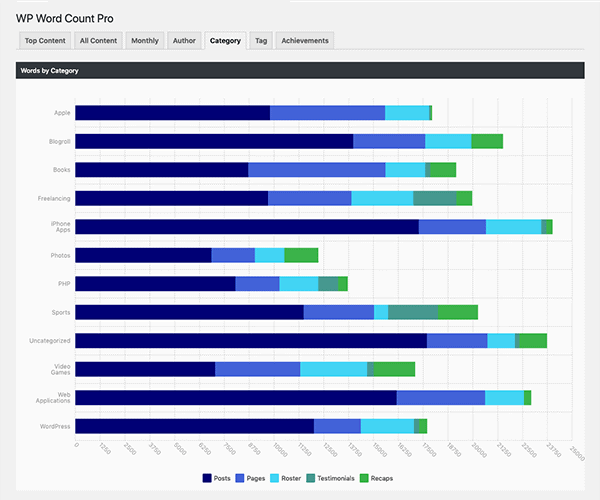 Discover how active your writers are and compare to other members of your team. 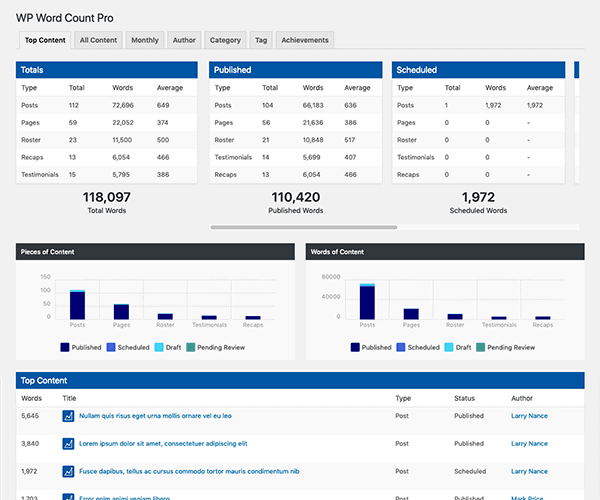 Quickly see stats for every post an author has written. Monitor their monthly writing output by word count and post type. WP Word Count Pro comes with additional statistics for all of the categories and tags you have applied to your posts and pages. You can see how much you have written for every section of your WordPress site at a quick glance with a useful chart or comb through each category and tag individually to see breakdowns by post type and status. 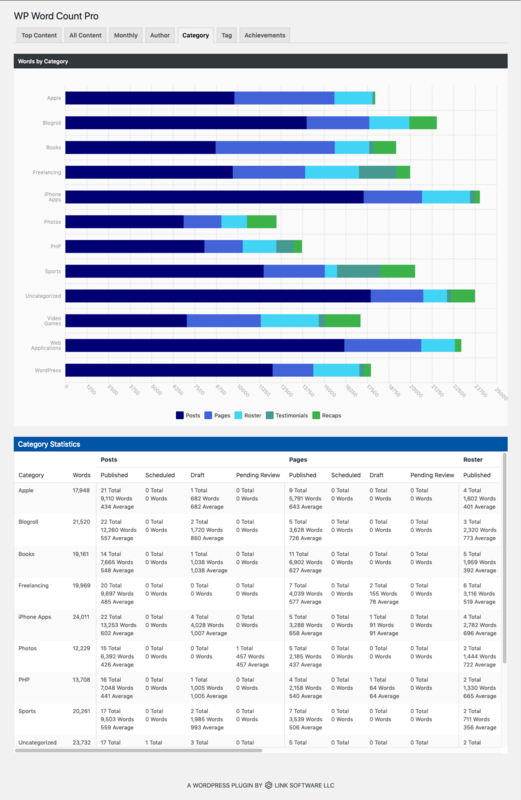 As with all WP Word Count statistics, these totals update in real-time as you update your site. 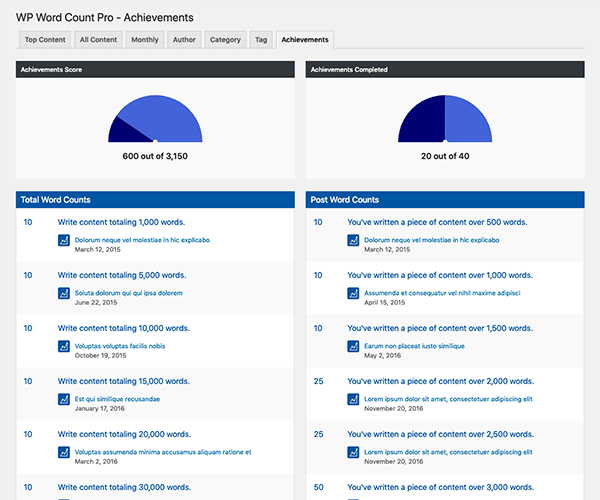 We’ve included an Achievement system in WP Word Count Pro that gives you points as you continue to write content and grow your WordPress site. The plugin tracks your overall word count as well as counts on individual posts to provide you with feedback as you write content for your site. Use your achievement score to motivate yourself to keep producing content and increase your word count higher and higher.